It's been a long time I had this great Starbursts stamp from Hero Arts and never had the chance (or the time?) to use it! Today is the day. This stamp is so versatile as it can also look as flower when you put a center inside them don't you think? This card took me much more time to make and I'm very satisfied with the result. I already made more backgrounds for my next time I will show you soon. So I first sprayed Lindy's stamp gang ink on a white cardstock. It was also my first time using this ink and wow, I just LOVE the two colors ink. It doesn't appear much on my picture but this ink is brown with blue metallic inside. Amazing effect. After the ink was dry, I stamped twice the starbursts stamp in black and once in blue and then, embossed it. I added blue and black Stickles inside so it looks more as flowers. I also added blue & black twines and made them go through my button. I like recycling stuff, so I used this black button my grand mother gave me when she did some cleaning in her sewing stuff. 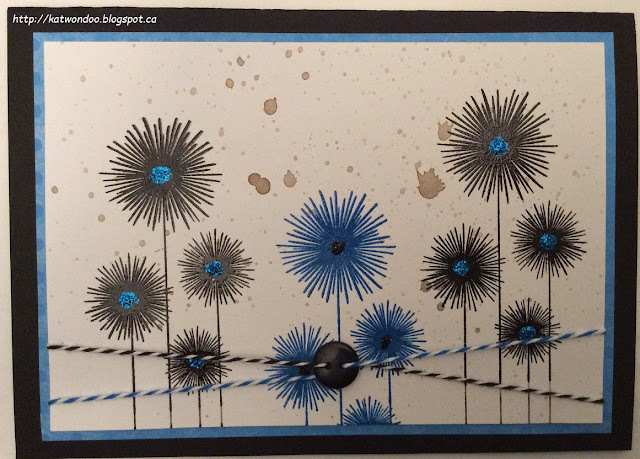 Then, I mounted my card on a blue patterned paper and then on a black cardstock. Brilliant use of the starburst stamp to make the flowers! I love how they turned out, and the muted background really brings them out. The threaded button is a great accent to your card! Thanks for joining our recycle/upcycle challenge this week at Simon Says Stamp Monday Challenge! Love the sparkle and shine and Lindy's is some of my favorite "sparkly" product. Thanks so much for sharing this gorgeous entry with us at A Blog Named Hero. Wonderful entry. Such fun blooms...love the sparkle! Thanks for joining the Hero Arts Fabulous Flowers Challenge!